When it comes to the safety of your loved ones, including your furry family members, it’s best to be prepared—really prepared. You can do many things before natural disaster strikes, and there’s no better time than now to put together a disaster plan for your pets. If a natural disaster warning is issued in your area, do not leave your pet at home. Many times, pet owners will leave home to seek lodging or to buy supplies, only to find that they can’t return home. Pets may run away out of fear or may refuse to leave the home until their owner returns. It’s always best to take your pet with you and then plan your next step. Dogs can end up several miles away from home so it’s good to have the numbers of a few shelters around your area. Customize your pet emergency kit to include what you’ll need. You may also want to add a printed sheet of the pet-friendly lodgings and important phone numbers mentioned in the tips above. The important thing to remember is that once you prepare the kit, make sure you and your family members know where it is so that it can be easily found. For examples, refer to the Centers for Disease Control’s Pet Disaster Kit Checklist and the Humane Society’s Disaster Kit Checklist. In addition to (or included in) the pet disaster kit, prepare a travel pack of your pet’s veterinary records and medications. 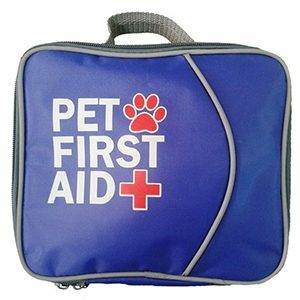 If your pet relies on medication, you will want this travel pack with you at all times. For some pet owners, this means keeping it in the kit. For others, they may feel safer having it in their own bag. Keep these important items in a waterproof bag. If you need to take your pet to an emergency animal hospital, having their records and medication ready for the emergency veterinarian may save precious time. To create a quick and simple version of your pet’s vet records, check out Proud Dog Mom’s Free Printable Vet Records Keeper. Since natural disasters and emergencies can strike at any time, set up a buddy system with a close neighbor. You could, for example, agree to pick up or care for the other person’s pets if one of you is unable to get home. In times of adversity, it can be a big relief to have someone your pet knows to look after them temporarily until you can be reunited. 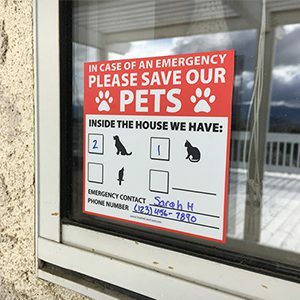 If you don’t have a buddy system in place, or your buddy is unable to reach your pets, a window decal on your home alerting others of your pets can be useful. For example, if your house caught on fire, the firefighters would know the number of pets in your home and do their best to find and rescue the animals. Some pets will hide when scared, so unless the rescue teams or a neighbor knows about your pets, they may not think to look for them. There are many types of pet emergency/rescue window decals available online. You can order a free one from the ASPCA’s website. 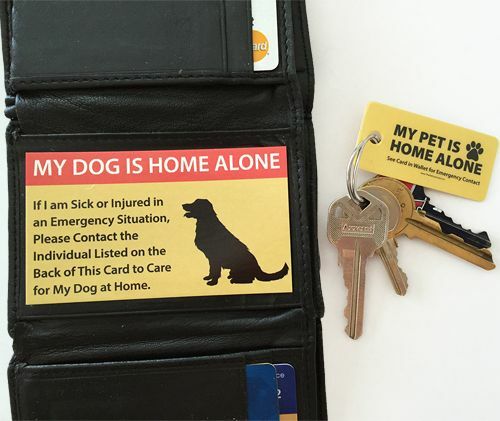 Another item you may want to consider is a pet rescue card to keep in your wallet or on your key ring. In the event you are in an accident, the emergency services team or hospital may be able to contact a relative to take care of your pets. Being prepared is the best insurance you can have. 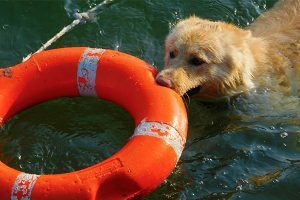 In the event of a natural disaster, you will be glad you put in the effort before you or your pet’s life depends on it. So get busy—start making a list, add items, and check them off one at a time.